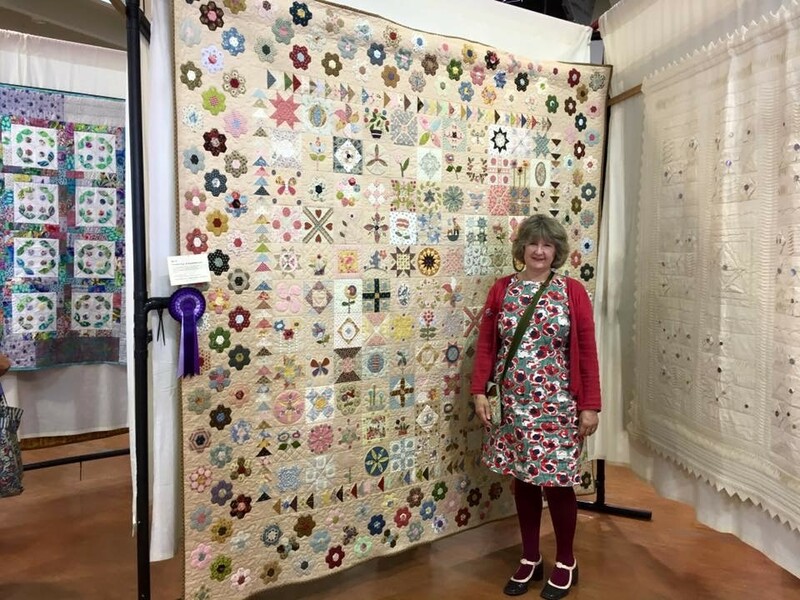 2017 was the year when I entered one of my quilts into national competition and what a year it turned out to be. My Stonefields – Find the Frog quilt had taken me two years to piece with a mixture of hand applique, hand piecing and machine piecing and another six months for Maggie, my long-armer, to complete (she did have a house move in between!). Like most of us my quilting is done in snatched moments – I work full-time in a stressful job so sewing in the evening is my down-time. However, sewing also took place on various holidays (yes I am one of those sad people who take a sewing machine on holiday), long train/plane journeys and anywhere I had 30 minutes to spare. Its first competition outing was at Sandown where I was delighted to win the Hand Applique award. However, what was even nicer was the positive reaction of my fellow quilters – both people I knew and others who just came up to me to chat about the quilt. Although we all know the pictures of groups of quilters coming together to make a quilt most of us enjoy our craft in isolation. I belong to Pogles Wood Patchers – we are a small house group made up of six school mums who bonded over our love of textiles. Some of stick to quilting, divorce would beckon if I took up any other craft as my fabric already fills the house, whilst others are craft tarts. We do not have a regular meet up time, but rather get together every so often with a bottle (or two) of wine, lots of cake and show our latest makes. 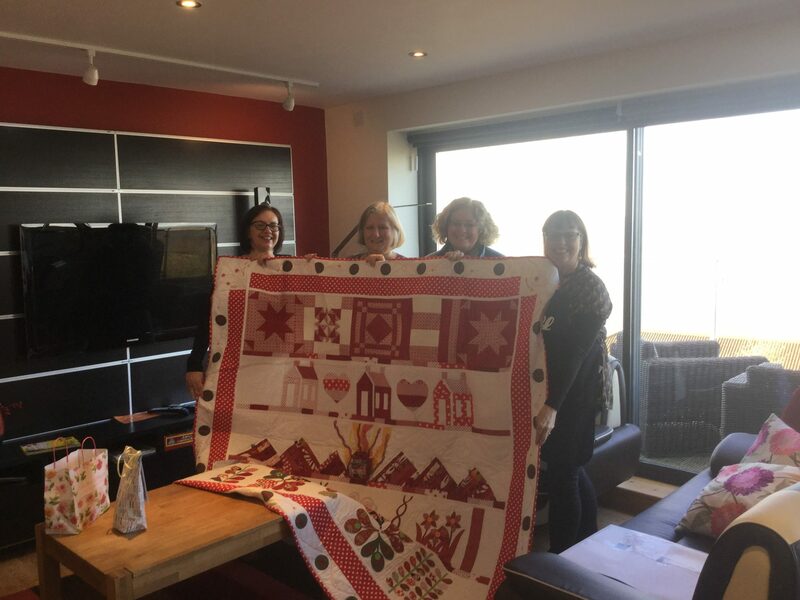 Below is a group quilt made for Melissa for her 50th birthday – she is Welsh and a teacher so this Sew a Row quilt featured schoolhouse block, Welsh mountains, handmade dragon, stars, Celtic wreaths and Orla Kiely designs. The quilt then moved on to Festival of Quilts, Birmingham which was really scary. My friends found it hilarious that I could not resist walking past my quilt at regular intervals to see who was looking at it – I am sure that bit of carpet was more worn than the rest. There is something really affirming about seeing other people take photos of your quilt. Its last outing was to the Quilters Guild Region 2 show, Hever Castle and it came away with a crystal rose bowl as Visitors Choice so all in all this quilt had a lot of fun in 2017. It is now on my bed ready for its next show at the Oast Quilters Showcase in 2019. Some eagle-eyed members of the UKQU group have noticed that I am rather fond of a colourful/unusual shoe. Therefore, I will feature my latest piece of sewing and favourite pair of shoes of the moment in a monthly photo. 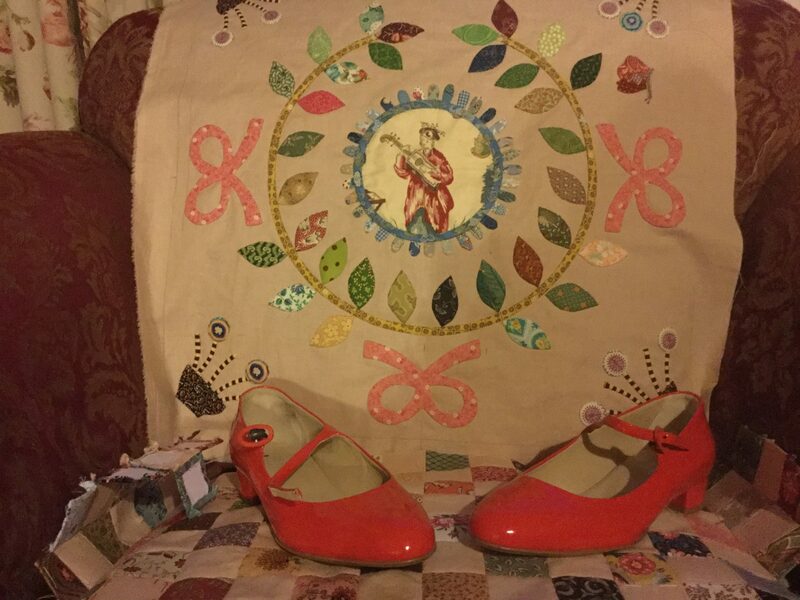 This month it is applique work for the Rowdy Flat Library Quilt (pattern by Susan Smith) plus a shiny pair of red shoes from Hobbs (outlet purchase – only pay full price for fabric). Love your blog Tansy – and the red shoes too!! I loved your quilt Tansy and spent ages looking for the Frog. 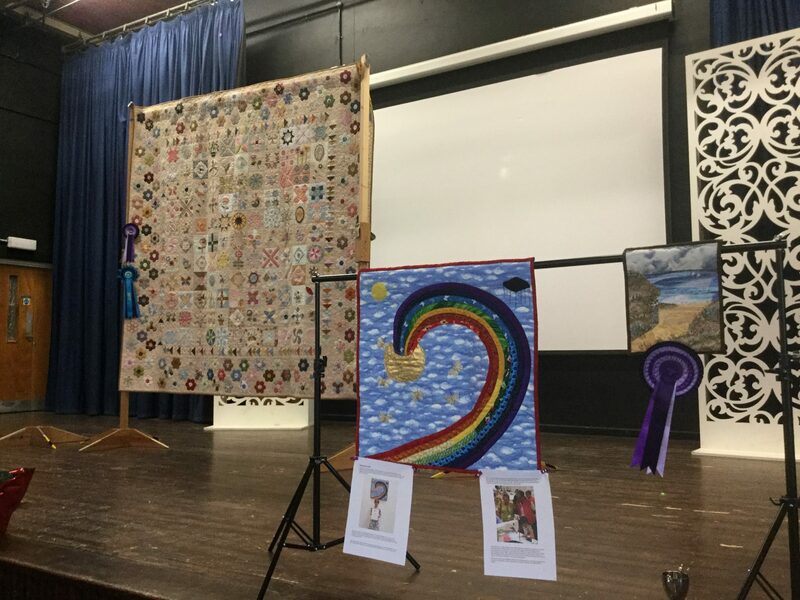 My first exhibited quilt was at Sandown too, hanging near yours and I also kept wandering by to hear what people were saying. Great shoes.